The sun is shining today and the promise of spring is back in the air after an ice storm Sunday night. I took the knitting projects outside to get some progress pictures for you so here goes. Yes, plural. 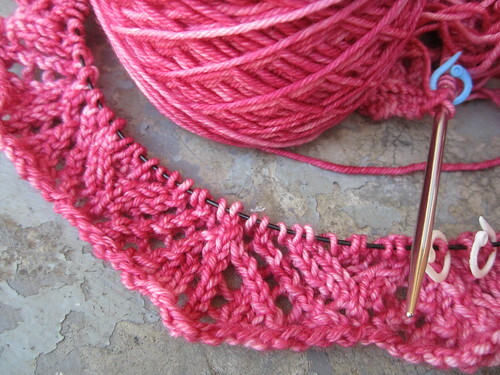 You have seen the start of my Holbrook last week and I am on the 14th of 20 repeats of the body stitch chart, so well into it now. It is a very memorable stitch pattern that I barely need the chart for at this point. This is the one that I am knitting. The three that follow are being knit by three of my daughters. Now they are not “knitters” but they know how to knit and I am paying them for their help, so that explains my title, LOL! I was not sure how well this would go since none of them have ever knit lace, worked from a pattern or charts. We had a little lace knitting 101 on Saturday and I got them all started and have been helping when they make mistakes but I have to say I am very impressed with their efforts. Now I don’t want to hear any more from you ladies in my booth about how you can’t possibly knit lace or use charts. You really have no excuse if my 14, 19, and 22 year old daughters who only have basic knitting skills can do it. :-) Oh and I also must say here that Dee’s patterns are absolutely top notch! Very thorough and well written! Okay so this is Catoctin which is being knit by Cassie, my 22 year old. (By the way I have these in my Ravelry projects because they don’t have accounts.) We are using my Classic Merino Superwash Sock yarn in the color Brilliant Blue. It has a lace pattern that is pretty straight forward on each side and a textured stitch in a field of stockinette for the center. It is probably the more complicated compared to Holbrook but she is doing well with it. This one is Nadira which my 14 year old daughter is knitting. I think she got this one mainly because it is purple and she is the one who doesn’t hate purple, LOL! 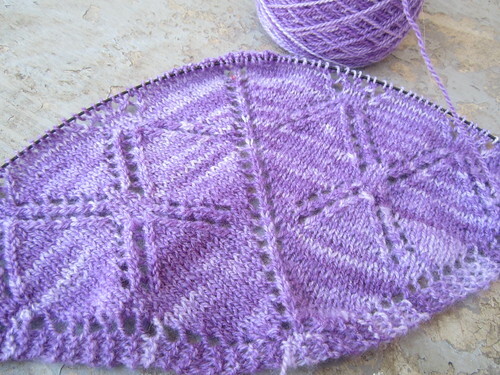 We are using my Classic Merino Lace in the color Amethyst for it. 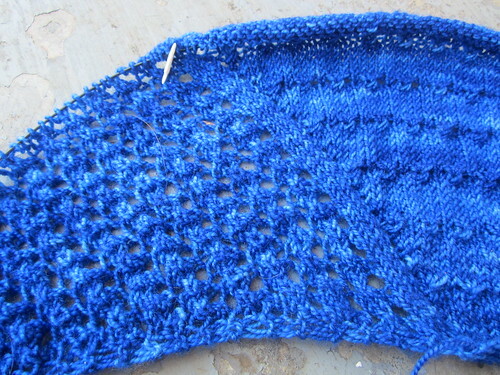 The top section has plainer squares and then they get lacier as the shawl grows. I really like that since it adds lots of interest in the knitting and the finished design. Dee also adds extensive guidance in the pattern for customizing this whole section of the shawl as far as laying out which stitch patterns you use. We are knitting it as written and shown in the sample. I am very pleased with how neat and even her stitches are in the stockinette. Pretty good for an inexperienced knitter, huh? Here we have Tristano in Classic Merino Superwash Sport yarn in the color Azalea. My 19 year old daughter is making this one. As you can see this one starts at the bottom with a long cast on of 333 stitches. It is slow going at first but she is almost done with the edge chart already. 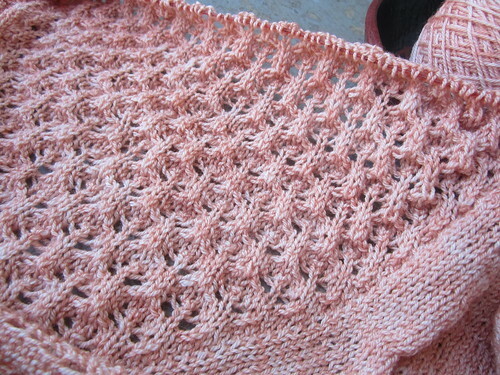 This is probably the “busiest” lace in the design as it gets progressively simpler towards the top. I think it looks great so far! Enjoyed this blog very much–way to go girls–keep it up!! And thanks for the new source for patterns–going to go check this out further. Your daughters are very talented! The shawls are all so pretty, I will look for them in your booth.